The Redco Hi-Temp Yellow kiln wheel bushing continues to be tested, and adopted, by sawmills across North America. Compared with the traditional blue nylon bushings, the Hi-Temp Yellows will outwear and outlast the blue bushings. While we cannot guarantee how much longer they last, around 50-100% longer is typical with our current customers, which also means less maintenance and downtime. The robust nature of the bushing’s proprietary kiln wheel plastic means they’re more forgiving if you forget to grease them. We’ve tested them in a mill running them without any grease for two months and they showed no wear. Using them this way is not recommended, but it shows you how strong these bushings are. This has been a three year project by Redwood Plastics to develop a superior kiln wheel bushing to the blue. The bushings can be supplied as the simple grease groove-less version or with a 1/4″ grease groove (does not affect price). Lead time is usually 3-4 weeks to ship from your local branch. Please note these are not a replacement for the phenolic (laminate/Micarta) higher-load bushings. 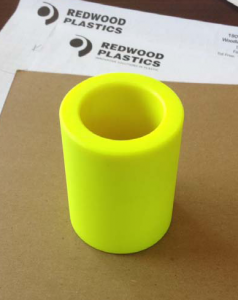 For more information or a quote on these Hi-Temp Yellow Kiln Wheel bushings or our other sawmill parts please contact us today.